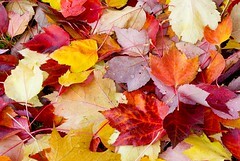 Fallen leafs lay on the green grass, sprinkling it with colorful accents. They add a freshness to the autumn season — and here’s a way they can have the same effect on you. Have you ever thought about ways to use leafs as decorations in your home? In many parts of the world, fall is in full swing. It’s a good time to bring the festive season inside your home. In addition to scented candles (like pumpkin pie and cranberry spice), you can add accents around your home to fully appreciate the comfort this season offers. The best part is, you can find these creative touches in your own backyard or on a stroll around the neighborhood. As you enjoy the crisp weather outside, pick up the beautiful leafs that catch your attention. It’s a good idea to collect a number of them and store them between the pages of a newspaper. Place a number of pages on top of the page that is folded over the leafs. This will gently flatten the leafs and won’t allow them to curl or crack as they dry. Let the leaves dry between the newspaper pages for a couple of weeks. This presses them into their permanent flat shape and keeps the texture in tact so they have the vein quality leafs have naturally. When the leafs have been successfully flatten between the pages of the newspaper, brush on a thin layer of glue like Mod Podge. This is an all-in-one glue, sealer, and finish. Let it dry completely before brushing a thin layer on the other side. Then repeat this step by applying a second layer. Once your leaf creation if fully dry it will be flexible, durable and colorful. Now you can apply your own creativity. Will you hang your leaf art? Scatter them in visible areas? Create a collage with them? The choice is up to you. Here’s one suggestion: Scatter them around your computer station. You can string some together and drape them over the monitor if you’d like. This way, on the chilly fall days yet to come, you can cozy up with an online art program, like Segmation – Paint by numbers, and explore the artist inside you while enjoying the artistic and festive surroundings you’ve created. Don’t forget your hot cocoa or warm tea. Image made available by OregonDOT on Flickr through Creative Common License. This entry was posted in arts and crafts, Autumn, colors, outdoors, Segmation, Uncategorized and tagged arts and crafts, Autumn, decorations, fall, festive decorations, leaf, leaf art, leafs, mod podge, newspaper, season, seasonal activities, seasonal art projects on October 19, 2011 by segmation.